In the year 2000 I’d been a widow for two years, and doing ‘guy” jobs had become my hobby. My next task was to remove black mold from our huge deck and stain and seal it again. I purchased deck cleaner and stain-sealer. The directions on the can of cleaner read, “Prepare dirty wood in three easy steps: brush it on, let it set, wash it off.” Oh hey, I can do this. My troubles began with step one: brush it on. With a push broom, I applied the bleachy-smelling stuff evenly on one small area at a time, and it was going well until I backed myself into a corner. With more thoughtfulness toward strategy, I carried on. The black mold turned lighter but splotchy. I stayed optimistic, feeling that step two–“let it set”–would take care of the problem. While I worked up a sweat, Rudy, my lawn-mower man appeared to do the weekly grass-cutting and he felt sorry for me. He said, “Oh, Betty, let me help you with that.” I was thrilled and stepped aside. Rudy worked best to music, so he turned on his tiny red radio that measured 3” x 4” and set the volume low so only he and I, and not the whole neighborhood, could listen to his Latino station. 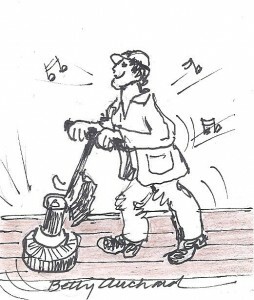 He swabbed the deck with the rest of the cleaner, bouncing to the rhythms of La Bamba. Rudy sprayed water everywhere and some of it got on the deck. As soon as he left I planned to spray a second time. Once alone, I held the power washer nozzle a few inches from the wood, and the deck was lookin’ great. It was so good that I hired Colin, my nineteen-year-old grandson to power spray the whole deck a third time. He said, “Nonnie,” I think you’re doing more harm than good by holding that nozzle so close to the wood.” Since he was just a kid, I pressed him to do it my way because it produced a cleaner surface. Colin worked best to music, too, so he turned on his black boom box to a heavy metal station with the volume on high so the neighbors could enjoy it. I tolerated my grandson’s music just to get the deck clean, dry, and ready to seal by morning so Rudy could get right to work. My oldest son, the fine craftsman, stopped by to see what I was up to and said, “Mom, this is not a good job.” I knew that. He didn’t have to tell me, so I sent him home. Right before I screamed “Rudy, you have used too much stain,” I noticed specks of brown on his teeth. Thick brown liquid puddled a third of 513 square feet of freshly sanded wood. It would never have dried. We got on our hands and knees and used squeegees to scrape puddles into dust pans and then into dishpans. Stain had found its way to the cement walk, the grass, our hands, jeans, shoes and Rudy’s big, white front teeth. What a mess. That night, I felt a cold sore coming on, which happens when I’m stressed. I learned a lot in the first years of widowhood. I learned that some of the “guy” jobs could be accomplished by guys found in the Yellow Pages and not by me or my lawn-mower man.